2002 - 2007, as the bassist of band Cool Blood Animals, he recorded albums "XTX", Only One Wish" and "Reggae and Chinese Zither". 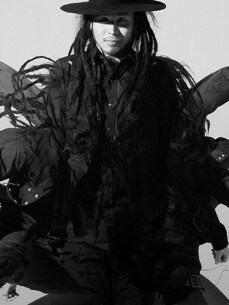 In 2005, he was in cooperation with the psychedelic band Fei Xu, recorded the album "Wu Kong". In 2007, he established one and first true sense of the reggae band LONG SHEN DAO, besides he has being the songwriter, leading singer and bassist in the group till now. He released the album “Embrace" in 2011. As DJ in 2012, Bass Guo hosted China Moon series electronic music party, released the personal Chinese Zither and Jazz Trio album "Four Return" in the same year. [In Chinese called “Si Xiang Fan"]. In 2016, the band LONG SHEN DAO released the album "Freedom", cooperated with Mansion records then released single "Asian Zoo" in European countries and China at the same year. Bass Guo have been invited to Japan, Australia, New Zealand, South Korea, Canada, the United Kingdom and other European countries and regions to participate in the music festival and hold tour shows. In 2014, Bass Guo began as a DJ joining in Strawberry Music Festival, MIDI Electronic Music Festival, Sound Of The Xity, and the Great Wall Electronic Music Festival and even performed on the electronic stages of other large music festival. Cooperated with the Netherlandish music label RELEASE, the UK electronic music label Psy Trance Goa Pro-ductions, Beijing Techhouse team 3 + 2 and Shanghai The Mansion team many times. At the same time, as lead singer of the chief reggae band [LongShenDao] in China, BassGuo and his band participated in the world's most influential British Glastonbury Festival in 2015. In September 2016, Bass Guo as a music DJ producer, formally contracted with ModernSky, his Live Set performance will also in the name of "Bai Si Guo in Bass Guo", performed with well-known musician. In October of the same year, Bass Guo was invited to Holland to participate in one of the world's largest electronic music festival Amsterdam Dance Event, shorted as "ADE".